Whether it be sourcing the finest entertainment, venue, makeup, or photography, we can help make your dream event a reality: here are some of the talented friends we regularly partner with. Orchids Retreat is a luxurious private treatment room that is operated by Diana Jenner in a peaceful rural setting. Beauty treatments at Orchids Retreat including wedding makeup, skincare, threading, waxing, massage, nail treatments, ear piercing and much more. A contemporary flower shop in Lymington, Hampshire, Yasmin Design Florists designs flowers for all occasions. Specialising in wedding flowers, funeral wreaths and bouquets, Yasmin Design Florists has more than 10 years experience attending to all floral requirements. Distinctly Flowers has supplied flowers across the south for more than 15 years, working in some of the most prestigious venues in Hampshire and West Sussex. Distinctly Flowers believes that floral arrangements are a work of art and so select the freshest flowers of the highest quality. AJ and Becki run South Coast Glamping, providing luxury camping experiences for weddings, hen do’s, stag do’s, parties, corporate events, festivals, glamping and other special occasions on the south coast of England. From single parties through to luxury events, South Coast Glamping can help. Based in Lymington, Hampshire, South Coast Marquees supplies stylish marquees for special events, all year round across Hampshire, Dorset and West Sussex. Established for seven years, the business is quickly built its reputation on customer satisfaction and word of mouth recommendations. Buchannan Events provides marquee hire for parties, weddings, social and corporate events for its customers. Serving the south of England, Buchannan Events has worked with a wide range of businesses, including high street banks, the National Trust, worldwide hotel chains and the Armed Forces. Wessex Cater Hire is a family business run by Jon and Christine Cooper, and Murray and Ginny Wyness. With operations in Southampton and Poole, Wessex Cater Hire provides an extensive range of china, cutlery, glassware, furniture and linen, plus chairs, tables and ovens, napkins and tea light holders. Singer songwriter Jonathan’s career jump-started at the Princes Trust concert in 1988 supporting Phil Collins. He later formed The Fuse with Richard Westall and has since performed at The Meanfidler, Glastonbury Stage, The Brook (supporting China Crisis) The Joiners, The Poole Arts Centre and The Show Bar. “Three musicians and a wall of sound”. Builded as the UK’s premier “Party Band“, BB3 is renowned for its stunning organic live show which ensures your event is on everyone’s lips. With an “all killer – no filler” set list, BB3 promises that your guests will be shaking and dancing all night long. Carrie is a photographer based in Milford on Sea, near Lymington, Hampshire who specialises in wedding, lifestyle photography and commercial work. She ensures her customers are comfortable, look great, have fun and enjoy amazing photographs that tell their story in a unique way. Helen, @ Renouf Design is a Qualified Graphics Designer and Photographer. Based in Lymington in the New Forest, she can help with everything to make your event go to plan with branding for online ticketing, to bespoke invitations, to a web site promoting the event to coming along and being your event photographer. Helen Rushton is a professionally qualified (MPA) and personable photographer who delights in capturing the special moments of your life in a relaxed but Fine Art style! Living in Romsey and with a stunning loft style studio in Salisbury, she specialises in Wedding Photography, Boudoir Photography and Bumps and Baby Photography in Hampshire, Wiltshire, Dorset and across the UK. Our houses are a luxury and eclectic collection of quirky homes in and around the ancient forest, rivers and beaches of the New Forest National Park. Whether you’re wanting a beach holiday, a romantic escape or a ‘Swallows and Amazons’ beach adventures for the all the family, we can help you. We often help people arrange celebrations. Milestone birthdays, weddings, ‘going away’ or ‘coming back’ parties and hen do’s. 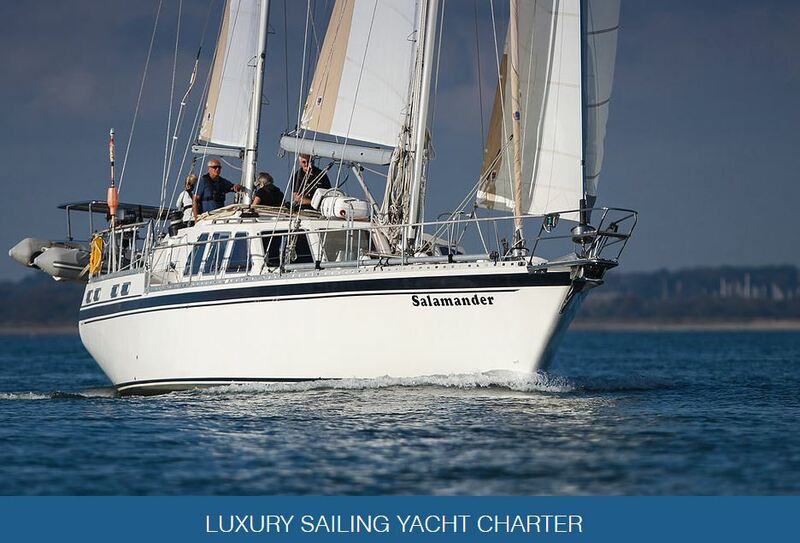 Salamander is a 58 foot luxury sailing yacht based in Lymington on the South Coast, and is available for private and corporate charter. Ideal for celebrations, sailing holidays, weekend breaks, day trips on the water, and delighted to work with 7th Wave to provide the perfect onboard catering soloution.